My husband is a man of many pleasures, one of which is food. He adores feeding his tummy all kinds of delicacies. He is usually not picky about his food nor has specific requests. He’ll just eat anything I give him! However, at his friend’s (Eric Wamsley) Fourth of July Bash his taste buds had a delightful experience he could not soon forget. 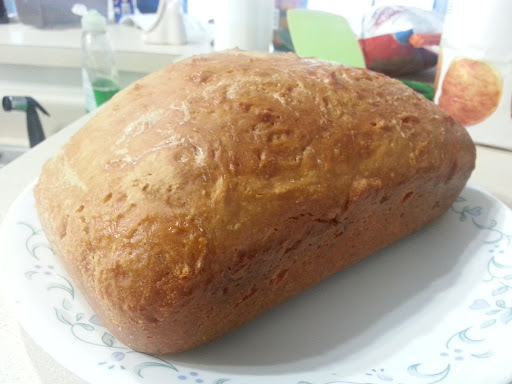 This is where he first tried something called beer bread, and ever since, I have been asked to make this. Luckily, his friend Eric gave him a quick recipe which I combined with one I found in Allrecipes.com. I have to admit, this bread is so very delicious. It’s crusty exterior combined with its moist yet firm bodice proves to melt even the coldest man’s heart. 1. In a large bowl, sift your 3 cups of flour then add the sugar, stir and then pour (slowly!) in the beer. Stir in until all the ingredients are combined into a brownish, sticky, doughy baby. 2. After the ingredients are combined, the dough will be very sticky. You’ll have to touch it. If you don’t like touching moist, wet-things I suggest you use gloves to mix the dough. Do not over do it. You’ll only need to mix until the dough takes form. 3. Preheat the oven to 350 degrees. You’ll want to make the bread’s home for the next hour the right temperature or else, he’ll become an angsty teenager and refuse to rise. 4. Once you’re finished with the mixing, cover the bowl and let the dough sit, at room temperature, for 30 minutes. 5. Grease your loaf pan; I like to add a bit of flour to avoid sticking. After you’re done greasing, add your delicious dough into its little bed and make sure the dough is evenly placed. Don’t pound the pan on the counter. It’ll just provoke its anger. You know how teenagers get. 6. Bake for 45 minutes and kindly ask the dough if you could pour some butter on it. If it says, “NO, GET OUT OF MY ROOM!” do it anyway. Then bake it for 15 more minutes.